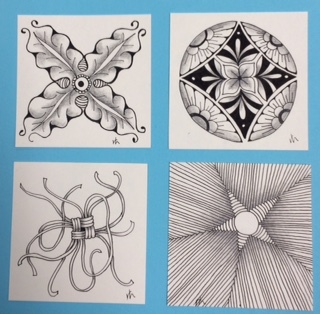 Join Certified Zentangle Teacher Rosie Hill for High Focus Tangles workshop Saturday, April 23, 2016 from 1:30 pm to 3:30pm at Coos Art Museum. Learn to create some beautiful tangles that look complex, but are accomplished like all tangles: one stroke at a time. These tangles require more strokes and a bit more concentration, but the challenge makes them even more satisfying. Students are required to bring a pencil, black micron pens–a 01 and 05 or 08, and a tortillion. All papers are included in the class fee. Zentangle books and other supplementary materials will be available for purchase. Teens and adults of all skill levels are welcome. Cost for the workshop is $30 for CAM members and $35 for non-members. Class size is limited to 20 participants. Registration ends April 23, 2016. For online registration use the booking form below or contact the Art Education Dept. at (541) 267-3901 ext 105.